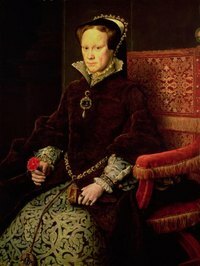 A painting of Queen Mary I, believed to be the inspiration for the Blood Mary game. Whether you're five or 15 years old, a sleepover is always a fun way to hang out with a girlfriend. While many games (like "light as a feather, stiff as a board") are made for a group of girls at a slumber party, there are a few activities that will work perfectly for just two girls. Bloody Mary is a scary game of saying "bloody Mary" into a mirror in a dark room 13 times. Sometimes, the number is three instead of 13. After her name is said the appropriate amount of times, Mary is said to appear in the mirror. Often, this is all there is to the game, although versions of the game include Mary showing the future of the summoners in the mirror. The game has been around for so long and been retold so many times that its origin is not 100 percent known. Often, it is told to refer to Queen Mary I. This why in some games, kids will say, "I killed your baby, I killed your son," at the end of the summoning. This references Queen Mary's many miscarriages. Sometimes, however, it is told to reference Mary, Queen of Scots, who was tried and beheaded for treason. Dress up is a game for girls of all ages. For younger girls, old Halloween costumes or clothes from older siblings or mom will provide plenty of entertainment. For older girls, dress up is more like a makeover. Hair curlers, lip stick and high heels can make for a night of pretend modeling or even a more realistic makeover on a friend. Dressing up and making over takes a while and is a great way to pass the time during a long night ahead. Two girls play dress up. Ouija Board is a Parker Brothers game based on old tablets called planchettes that are from as early as 1100 B.C. The board is used to talk to spirits and, as a game, is best for older girls in their teens. The game is played with two people keeping their hands on a triangular "eye," summoning the spirits and letting the eye move to different letters spelling out what the spirit is trying to tell them. Many people don't believe it because it's hard to determine if the other person is actually moving the "eye." Others claim that it's actually the human nerves moving it subconsciously. Whatever it is, it's sure to be an interesting and frightful sleepover with the Ouija involved. Sleepover crafts are also good for girls of all ages. A plain T-shirt at a craft store should cost around $5. Some puffy paint, iron-on letters and glitter are also inexpensive and can make for a fun night for two girls. Not only is it fun, but they'll have something to show when the night is over. Baking is another way to have fun and be creative at a sleepover for two. If the girls are older, baking chocolate chip cookies or cupcakes in the real kitchen works. For younger girls, an Easy Bake Oven works also. This can be paired with dressing up with aprons and pot holders. Decorating an apron with puffy paint before baking is also a nice combination of crafty ideas. Baking cookies is a good sleepover activity. Whether 10 girls or two, Truth or Dare is a fun game to learn more about your friends and have some fun at the same time. In this game, the question "Truth or dare?" I asked, then answered or performed. Once the choice is made, there is no turning back. However, sometimes the dare is given first and then the choice must be made. With younger girls, questions and dares will likely be innocent. Keep watch on the older girls, though; make sure they don't get out of line. A sleepover is about getting to know each other.